A new-build 33.8 metre Mangusta 110 motor yacht has been sold by Exocet Marine to an American client. To be built in GRP by Italian yard Overmarine, this yacht is the third hull in the series and delivery is slated for summer 2018. The new yacht is set to maintain the racy, sporty profile that Mangustas are known for, with an up-to-date exterior aesthetic and greatly expanded outdoor living spaces. An evolution of the Mangusta 108, the new 110 boasts a spacious flybridge, which can host a second helm station. The standard layout allows for four cabins accommodating up to nine guests. Overmarine offers semi-customisable interior options, allowing for other layout choices and interior styling. Powered by twin MTU 16V 2000 M96L diesel engines linked to KaMeWa waterjets, she will easily reach a speed of 33 knots while ensuring high stability, low vibration and low noise levels. The Mangusta 110 also features zero-speed gyroscopic stabilisers for comfort at anchor and underway. Francesco Frediani, commercial director at Overmarine, comments: “This success demonstrates that American clients are familiar with and appreciate Mangusta maxi open yachts, acknowledging their aesthetics, functionality and technical quality." The Overmarine Group has been using waterjets for more than 30 years, and to date it is one of the few shipyards that installs them as standard on planing and semi-displacement vessels. 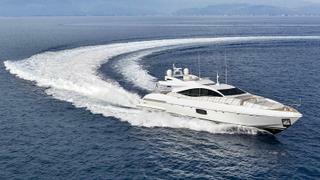 The asking price of the third Mangusta 110 has been withheld.